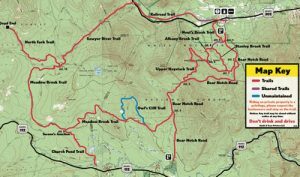 About our club – The White Mountain Trail Club is a small club whose goal is to provide an integrated trail system that can accommodate the needs of private, public and business interests while promoting a good community relationship. Through the efforts of volunteers who spend over 400 hours per year clearing, grooming and maintaining the trail system, there are now approximately 50 miles of trails open to all types of use. While our roots are that of a Snowmobile Club; over the years we have evolved with the times to recognize and support all outdoor enthusiasts. The vast majority of our trails are on state or federal land and through responsible and respectful use will provide all users a way to enjoy nature at her finest. 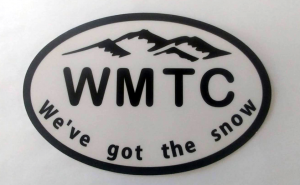 So, whether your preferred mode of trail use is a Mountain Bike, Snowmobile, Dog Sled, Skis, Snowshoes or even a pair of Boots, The White Mountain Trail Club is for you. Why not become a member today? Snowmobiles – Remember there are novices on the trails. We all had to crawl before we learned to walk. Please keep this in mind when approaching other snowmobiles on the trails. Also, please keep in mind that there are others on the trails, some using skis or snowshoes and perhaps even dog sleds; please pass safely and courteously. Obey all trail signs including speed limit and Closed Trail signs. Be aware of and stay off of Cross Country Ski Only Trails. Skiers and Snowshoers – Please be aware of others on the trails. If a snowmobile is approaching, allow room for it to pass you safely. Should you be enjoying the trails with a 4 legged companion, please keep your companion tethered. Keeping your dog tethered is for everyone’s safety, including your dog’s. When nature calls, please take your dog off of the trail; others should not have to watch out for “doggie bombs”. It’s the way you enjoy the trail that makes the memory – it is yours to experience..